Livestock bill of sale form is used by the farmers or parties who want to purchase domestic farm animal/s, like cattle, camels, goats, chickens, pigs or any other type. On this livestock bill of sale form, you can buy up to six types of animals and for more than six types another form will be used. 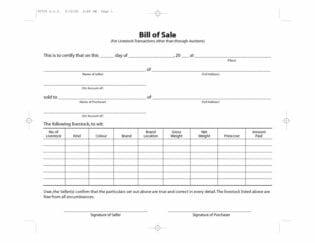 Livestock bill of sale form is not used if livestock is purchased through an auction. 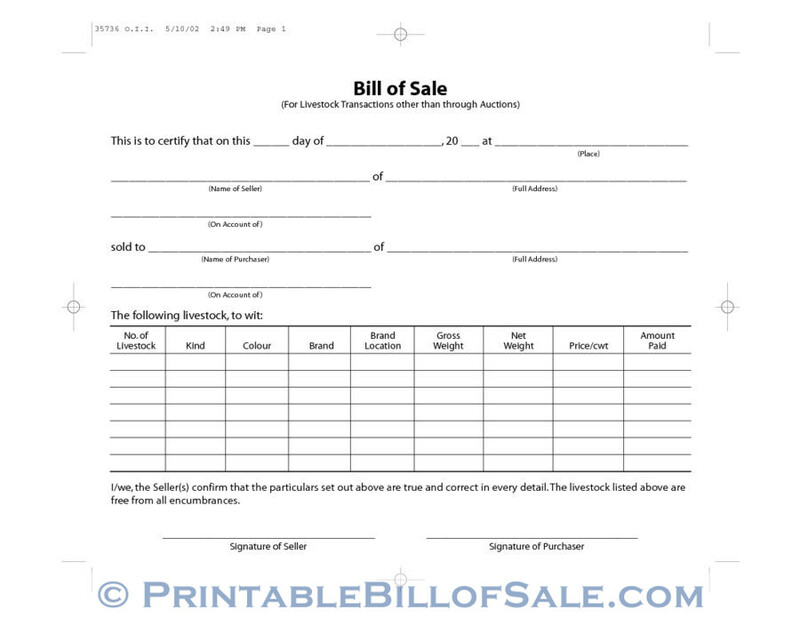 Livestock Bill of sale form is the legal documents. It is a general form, which is used in the whole of USA, except when another form is introduced by a State or a country. Every State and country has its own laws and this bill will be governed by those rules and laws. Livestock Bill of sale form is a comprehensive form in which information about the livestock is recorded, including age, gender, class and weight. In this part, the date, month and year is mentioned along with place, where this bill is being signed. In the next place the name of the seller, his/her full address is mentioned. In the next place, the buyer’s name and his/her full address is mentioned. In this part of Livestock Bill of sale form, there are different columns for giving the information about the livestock. of livestock means how many livestock/s of this kind. Kind means, if it is a sheep, buffalo or another kind. Color means white, red, and black, etc. Brand means the special mark or earmark or ear tattoos. It is done to identify the livestock and there is a system of branding the livestock in the USA. Brand location means, the location from where the brand was issued or marked. Gross weight is the total weight of “livestock plus the weight of the container”. Net weight means the weight of livestock only. It is equal to gross weight minus tare weight. Price is to be mentioned in US Dollar/cwt. CWT means hundredweights. It is the unit of measurement of weight for livestock and other commodities. In the USA, hundredweight mean 100 pounds. Amount paid is the amount, which has been paid; it should be full price or part of it. In this portion, the seller confirms that the particulars given above are correct and that the livestock is free from any burden or hindrances. In this part, the seller and the buyer sign the livestock bill of sale form.